Stop talking banalities. Especially the ones with long art theory words in them. Please. I could read it in his eyes, framed in the very polite frown that people put on their faces when they want to be seen focused and “with you”. He was a friend of mine I’d decided to introduce to the scratched worlds of Gerhard Richter at Tate Modern. I was talking about composition, saying something like “in a great painting, composition is the key to understand the meaning of the story the artist wanted to tell”. I admit, it is a phrase void of any practical meaning until applied to a real painting. Like what I did in the previous post on a Van Gogh’s landscape. But you don’t have a Van Gogh painting whenever you need it. As with many things in life, when you need it most, it’s not there. So, I thought of an object-based lesson right there, on the spot. 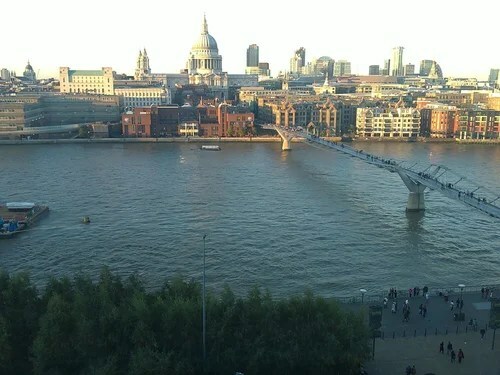 The lesson involved three meanings that a picture of London taken from the second floor of Tate should be sending across to a potential viewer. Task 1. Take a “touristic” photo, saying I’ve been to London. Easy. Most interesting shapes, forms, scenes in the middle, not too much of the sky, not to much of the river, with the usual instinct to get everything, including both banks of the Thames, into a single picture. You don’t have to think to take it, it just comes out on its own. Task 2. London is a spiritual city. Merchants, city bankers, embankment restaurants, the bustle of the megapolice life rhymed by the cupolas and spires of churches and cathedrals. Voilà! 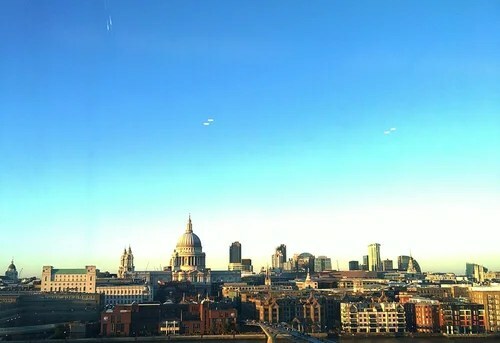 We don’t show the river, we show the skies, the spires, and the city. Task 3. 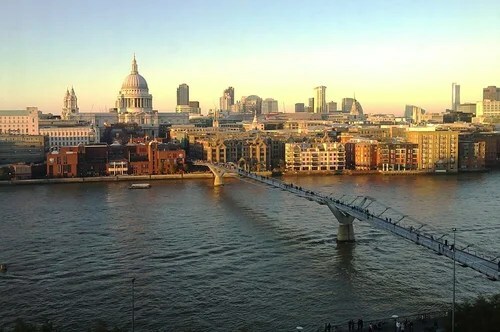 London is a city which history is linked to the river. Ok, forget the skies, focus on the river and wait until a couple of ships sail into the frame, preferably in the opposite directions. We didn’t wait for the ships, we imagined them. Task 4. Take a picture that will have a human dimension, what the newspapers call “a human story”. A human story in London. I was surprised that my tired friend came up with a solution in a few seconds. Very lonely art lover who is in love with Tate. She’s not happy, methinks. She wants to be there in the city, mingle with the crowd, meet someone who is not Tate! But she’s stuck. She is afraid to cross the rubicon of the Thames in search of a new life. I find his story madly romantic. For all I know, the lady in the picture could be a happy mom of two. But what matters, is that he learned how “composition becomes the key to the meaning”. Next time you happen to be at a spot from which everyone is taking pictures as if the view is bound to stop existing tomorrow – think about three different meanings, and change the composition to accomodate each of them. It’s a game best played by two. If it is your boyfriend or girlfriend – I promise the romantic returns of immesurable worth. This entry was posted in Art and tagged Art, Art theory, arts, Composition, Inspiration, London, Photography on November 22, 2012 by artmoscow. ahead and give you a shout out from Huffman Texas! Just wanted to say keep up the fantastic job! If it makes your experience of being exposed to art more interesting intellectually and richer emotionally, then yes, my mission is accomplished ) in the real life though, developing art appreciation skills requires a lot of work and thinking each time you get to a gallery. Richter has been written about by many, I will think if I can add anything new. 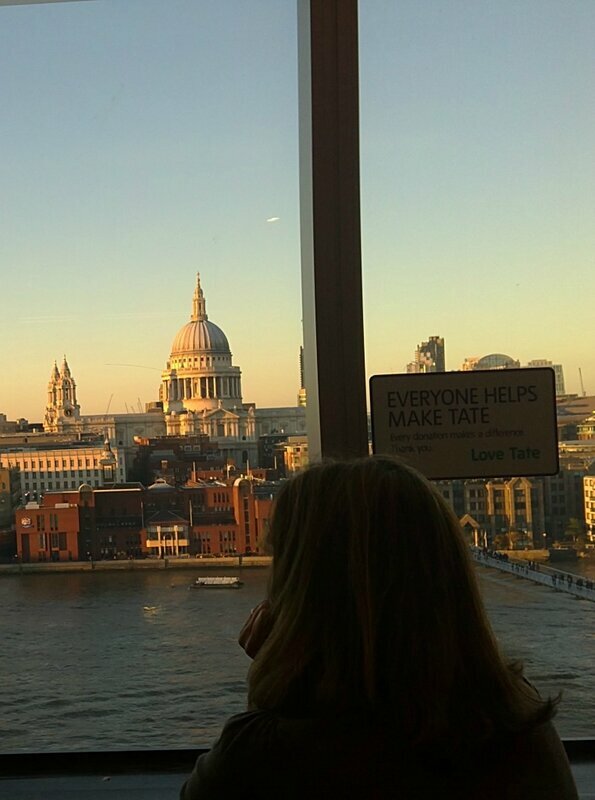 I really love the view here from the Tate. Your post gave a very insightful change in perspective! I loved this! Thanks for getting this photographer thinking today. As an old greek man once said, “The mind is not a vessel to be filled, but a fire to be kindled”. I am happy to have kindled a thought ) You are very welcome, and thanks for stopping by! I’m definitely guilty of taking too many shots that look like #1. Thanks for the nudge towards the alternatives. Cheers. Love the human dimension…but your words draw me in as much, if not more than the photo! Congrats on the FP. Thank you, indeed – it means a lot for me, this praise from an experienced photographer! ) When I launched this blog I was afraid readers would be struggling through my English. Thank you! I’d rather be in Firenze than London! My friend, London is a dump.